You Are Invited To A Tangled Birthday Party! My little girls favorite Disney movie right now is Tangled and that is the party theme I decided upon for her fourth birthday party. It was very easy to get ready for this party because I am so familiar with the movie and characters...we watch it all the time. Here are some of the fun ideas I used to entertain the kids. 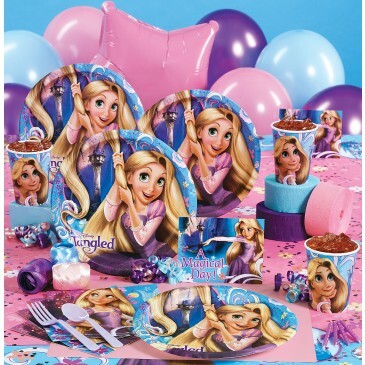 I bought the Deluxe party pack of Tangled party supplies. It came with party invitations...we dressed the envelopes up with Rapunzel stickers and we think they looked very pretty. The pack comes with plates and party ware, a tablecloth and decorations. I hung the streamers around the room and hung the balloons from the ceiling. I found purple and pink swirl lollipops and put them in small dixie cups I filled with foam so they looked like flowers on the party table. There were activity mats in the party pack so I used them at each place setting. Everything looked so pretty in the pinks and purples! I got the kids some candy jewelery kits to make. Since the girls were all four years old I asked two other Moms to come and help me on the day of the party. The extra hands made helping the girls with these crafts really easy. I put some Rapunzel stickers into plastic Easter Eggs and we had a Rapunzel Egg Hunt. The girls enjoyed it very much and loved the stickers they found inside the eggs. I printed out lots of coloring pages with Rapunzel and FLynn on them. Any time the girls wanted to they could go and color. It worked out really well while we were playing games. We played a couple musical games and they went over really big with the girls. They were not related to the theme but it didn't matter! I made a birthday cupcakes with pink icing. I put Razpunzel cupcake rings on them. Each of the girls got to keep the ring from their dessert and one of the big swirl lollipops from the table too. They also kept the candy bracelets they made. My darling daughter was thrilled with her Rapunzel birthday party and so were the guests. The extra help made the party very easy for me, so we all had a fun day! All in all my little girl had a great time! And if she is happy I'm happy! Thanks for submitting your story Lila. I am glad your daughter enjoyed her birthday party! Tangled is a fun theme and we do have some ideas on our Tangled Party Ideas.